Starting with electrostatic forces in atoms, this book combines electron orbitals to give an innovative approach to basic understanding of the electronic structure of covalent and ionic solids, simple metals, transition metals and their compounds. 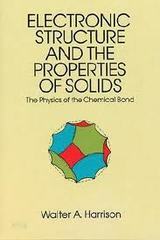 It also explains how to calculate dielectric, conducting and bonding properties for each. Includes a useful "Solid State Table of the Elements" that facilitates calculation of dielectric properties with a pocket calculator.